Sportganic™ Pre+, a premium sports nutrition pre-event and pre-workout supplement made from nutrient-dense performance botanicals, is now available for purchase on health, wellness and beauty product e-commerce site VitaBeauti.com. Sportganic™ products use clinically proven performance botanicals to help with focus, flexibility, energy, stamina, performance and more. Athletes who have tried our Pre+ formula swear by it. The finest ingredients were selected, including powerful nutrients that ensure muscle growth and recovery. We provide a tasty and convenient supplement with just the nutrients you want, and none of the chemicals you don’t want. 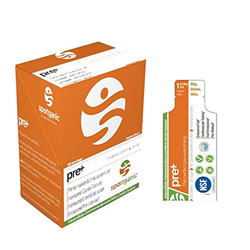 Sportganic™ Pre+ is designed for athletes in all sports as a sugar-, caffeine- and stimulant-free supplement. Pre+ was popularized as the first pre-event supplement on the market to be NSF Certified, guaranteed to elevate performance for an extended workout. “Athletes who have tried our Pre+ formula swear by it,” Sportganic™ CEO Tad Timothy said. “The finest ingredients were selected, including powerful nutrients that ensure muscle growth and recovery. We provide a tasty and convenient supplement with just the nutrients you want, and none of the chemicals you don’t want. Sportganic™ Pre+ contains L-Citrulline Malate, an amino acid designed to maximize blood flow by creating Nitric Oxide to help widen the blood vessels; L-Arginine HCL, another amino acid designed to relax blood vessels, improve elasticity and help blood flow, specifically around the heart and arteries. Beet juice powder also helps improve stamina during exercise and endurance training, and its watermelon extract, which is naturally rich in L-Citrulline and L-Arginine, has been linked to amazing health benefits associated with lowering blood pressure, hypertension and cardiovascular improvement. Sportganic™ products use clinically proven performance botanicals to help with focus, flexibility, energy, stamina, performance and more. They also are vegan friendly and made only from premium, non-GMO materials. For more information on Sportganic™ and its line of products, visit http://www.sportganic.com, or purchase Sportganic™ Pre+ on VitaBeauti.com.